Today, Baltimore City State’s Attorney Marilyn Mosby decided to drop the charges against the remaining three officers connected to the death of Freddie Gray. From the very minute that Mosby stood outside on the steps of her office and announced to the world that she would seek to move forward with the prosecution of the six officers involved, she had faced a bevy of criticism. Was this in haste? Is this a political move? Could she prove the case? Was she in over her head? Since that time, her office has gone a regrettable 0-6 in holding any of the cops accountable for Gray’s death. After each blow to the prosecution’s case, there was more criticism, and in light of today’s decision to dismiss all of the remaining charges, it is likely that Mosby’s detractors will be louder than ever. But is that entirely fair? From a legal perspective, Mosby’s case had its issues from the very outset, and as time passed, the problems only got worse. A big part of how things in this trial went left is that the prosecution’s strategy backfired early. Mosby’s office based its approach, in part, on what it hoped would be the cumulative momentum of convictions in earlier cases with less serious offenses, building toward stronger cases against the officers charged with the most serious crimes. The first setback came before any of the trials had even started, when the officers stated through their attorneys that they would not cooperate with the prosecution and refused to testify against their fellow officers. When Officer William Porter’s trial ended in a hung jury, it was the next step backward because the prosecution had to make some difficult calls on the fly: Should it seek to retrial Porter before proceeding with the other cases? Should it offer Porter an immunity deal for testimony against the other officers? These are all judgment calls that placed Mosby in the most precarious and unenviable of positions. Following Porter’s mistrial, more evidentiary rulings from the court only made things more difficult for Mosby’s case going forward. Arguably, the pivotal moment in the series of cases came when Officer Edward Nero decided to waive his right to a trial by jury and seek a bench trial. After Porter’s mistrial, the citizens of Baltimore had only grown hungrier for a conviction to quell their thirst for justice. Putting the case before another set of Baltimore citizens as part of a jury trial was not likely to bode well for Nero—regardless of whether the facts against him might have been strong. By opting for a bench trial before Judge Barry Williams, Nero’s legal team effectively removed the case from the realm of public opinion and, in doing so, neutralized one of Mosby’s strongest weapons against not only Nero but all of the other officers. Once Nero was acquitted, the officers’ blueprint for how to beat their cases was cemented, and it should not have been a surprise to see the next officer, Caesar Goodson Jr., also opt for a bench trial that also resulted in another acquittal. With as many moving parts in the air as it takes to coordinate one trial, attempting six at one time amid the high-profile nature of these cases might as well have been a handwritten invitation for Murphy’s Law. And once things went bad early, they snowballed even worse, and much more quickly. 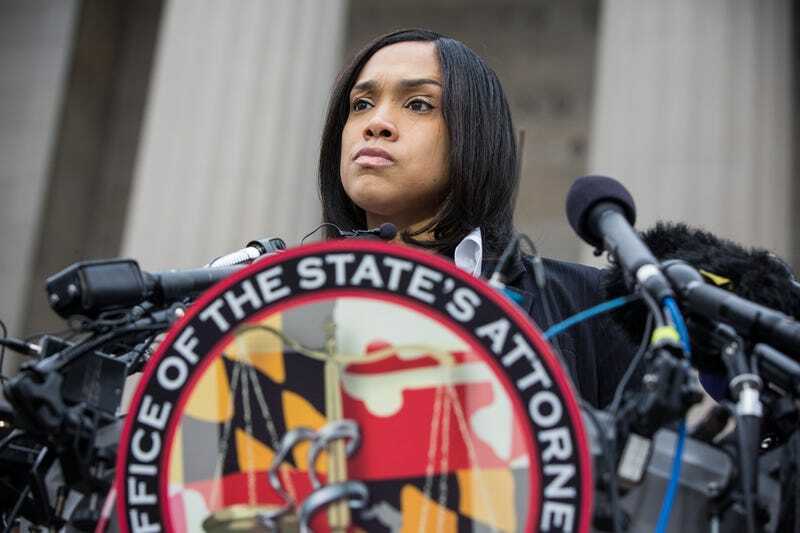 Was Mosby wrong for prosecuting? Absolutely not. The notion that Mosby somehow committed some sort of ethical violation or that she abused her discretion is absurd. Prosecutors make decisions about whether to prosecute, legally, based on probable cause. What we know is that Freddie Gray is dead and that he died while in the custody of Baltimore police. We also know that the manner of injury that was the ultimate cause of Gray’s death suggested that it was more likely than not that a crime had occurred—even if that crime was something as basic as criminal negligence. That means Mosby had the probable cause to justly proceeding with the prosecution of those officers. Period. So what should Mosby have done? Think back to the iconic moment when Mosby emerged from her office and walked confidently to the microphone to announce the indictments for all six officers. And contrast her grace and calm with the frazzled press conferences that Baltimore Mayor Stephanie Rawlings-Blake was routinely giving without a fraction of the poise or savvy that one would expect from the city’s highest-ranking elected official. Baltimore was burning and in pain. Mosby’s decision in that moment may not have resulted in convictions, but how many prosecutors across the country have had the gumption to do what is right and hold police accountable when there is suspicion of misconduct or abuse of force? Mosby showed more leadership than anyone else in the national spotlight at that time, and displayed a courage that helped calm a city at a time when it was threatening to tear itself apart. She did this while having the legal basis to go forward, even if the end result suggests that she came up empty-handed. It’s easy, albeit unfair, to question Mosby’s decision-making as a Monday-morning quarterback. Criminal trials can be a minefield, and even with the strongest of facts, there’s no guarantee that Mosby would have been able to secure a conviction. There are no winners here, but a leader like Mosby shouldn’t be lambasted for doing what she felt was right in the moment, especially with a proper legal basis. She may not have been able to deliver convictions, but in the moment she brought those charges, she may have saved a city.